Looking for an amazing deal? I was looking for an excuse to crowbar this photo (Runnergirl, are you out there?) I took at Ikea recently into a post, when I came across this advertisement on ikea.com. Limited quantities you say? Get out. 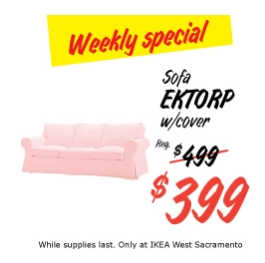 Author RonTopofItPosted on September 2, 2010 Categories BusinessTags advertisements, ikea, labor day, West Sacramento2 Comments on Looking for an amazing deal?